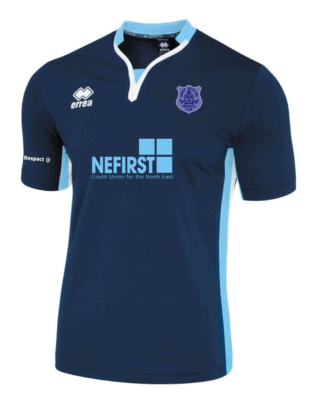 The Club officially launched NEFirst Credit Union as its new main sponsor last Saturday. The Credit Union invited figures from around the region to attend the launch, including the Bishop of Durham Paul Butler, who was among those who attended the event to show his support for the sponsorship. One of the driving forces behind the deal was the opportunity for the two organisations that share the same core values to collaborate. Both organisations are community focussed and this is something that has brought them together. NEFirst is a not for profit organisation owned and run by its members. 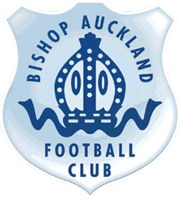 The Club’s Commercial Director Dave Mills is very enthusiastic about the deal and said: “This partnership is the flagship and most prestigious sponsorship, advertising and marketing product at Bishop Auckland Football Club. 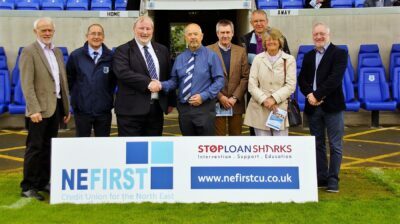 NEFirst is committed to stamping out loan sharks. The England Illegal Money Lending Team (IMLT) – a national team that investigate and prosecute loan sharks – has contributed £5,000 of proceeds of crime money to use towards this deal, that helps raise awareness of the dangers of loan sharks to local residents and football fans. The team will share sponsorship with the Credit U nion, as they try to get fans to turn away from loan sharks and start saving and borrowing with the credit union instead. As well as sponsorship, IMLT will have information in match programmes, announcements at games, and will work with the club on social media campaigns throughout the season. This funding has come from proceeds of crime money; cash confiscated from convicted loan sharks, following successful prosecutions. A loan shark is someone who lends money without the correct authorisation from the Financial Conduct Authority (FCA). For more information about NEFirst visit www.nefirstcu.co.uk.